Our new book PostgreSQL: Up and Running is officially out. It's available in hard-copy and e-Book version directly from O'Reilly, Safari Books Online and available from Amazon in Kindle store. It should be available in hard-copy within the next week or so from other distributors. Sadly we won't be attending OSCON this year, but there are several PostgreSQL talks going on. If you are speaking at a talk or other PostgreSQL related get together, and would like to give out some free coupons of our book or get a free e-book copy for yourself to see if it's worth effort mentioning, please send us an e-mail: lr at pcorp.us . Our main focus in writing the book is demonstrating features that make PostgreSQL uniquely poised for newer kinds of workflows with particular focus on PostgreSQL 9.1 and 9.2. Part of the reason for this focus is our roots and that we wanted to write a short book to get a feel for the audience. We started to use PostgreSQL in 2001 because of PostGIS, but were still predominantly SQL Server programmers. At the time SQL Server did not have a spatial component that integrated seamlessly with SQL. As die-hard SQLers, PostGIS really turned us on. As years went by, we began to use PostgreSQL not just for our spatial apps, but predominantly non-spatial ones as well that had heavy reporting needs and that we had a choice of platform. So we came for PostGIS but stayed because of all the other neat features PostgreSQL had that we found lacking in SQL Server. Three off the bat are arrays, regular expressions, and choice of procedural languages. 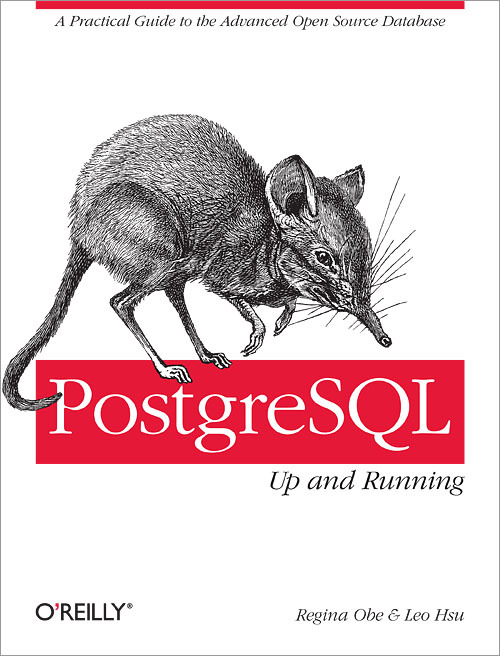 Most other books on the market just treat PostgreSQL like it's any other relational database. In a sense that's good because it demonstrates that using PostgreSQL does not require a steep learning curve if you've used another relational database. We didn't spend as much time on these common features as we'd like to in the book because it's a short book and we figure most users familiar with relational databases are quite knowledgeable of common features from other experience. It's true that a lot of people coming to PostgreSQL are looking for cost savings, ACID compliance, cross-platform support and decent speed , but as PostgreSQL increases in speed, ease of features, and unique features, we think we'll be seeing more people migrating just because its simply better than any other databases for the new kinds of workflows we are seeing today -- e.g. BigData analysis, integration with other datasources, leveraging of domain specific languages in a more seamless way with data. So what's that creature on the cover? It's an elephant shrew (sengi) and is neither an elephant nor a shrew, but closest in ancestry to the elephant, sea cow, and aardvark. It is only found in Africa (mostly East Africa around Kenya) and in zoos. It gets its name from its unusually long nose which it uses for sniffing out insect prey and keeping tabs on its mate. It has some other unusual habits: it's a trail blazer building trails it uses to scout insect prey and also builds escape routes on the trail it memorizes to escape from predators. It's monogamous, but prefers to keep separate quarters from its mate. Males will chase off other males and females will chase off other females. It's fast and can usually out-run its predators. Make changes to JSON dataset object and send back to the web server. On webserver unravel the JSON object and save to respective database tables. This part is really yucky as it often involves the web application server side language doing the unraveling and then yet another step of setting up stored procedures or other update logic to consume it. We hate the way people build tiers for the same reason Cartman hates lines at the amusement park. Sure tiers are great for certain things like building connected microcosms, but most of the time they are overkill and if applied too early make your application needlessly complicated. In the end all we care about is data: serving data, analyzing data, getting good data and everything else is just peacock feathers. unless typeof o is "object"
UPDATE TO UPDATE: Bruce Momjian suggested replacing the dynamic set local sql with set_config. We've revised further to incorporate this suggestion. That got rid of our last pet peeve about this function. Thanks all. Simon Bertrang proposed using set local which seems much nicer. We've updated our function using his revision. One of PostgreSQL's nice features is its great support for temporal data. In fact it probably has the best support for temporal data than any other database. We'll see more of this power in PostgreSQL 9.2 with the introduction of date time range types. One of the features we've appreciated and leveraged quite a bit in our applications is its numerous time zone aware functions. In PostgreSQL timestamp with time zone data type always stores the time in UTC but default displays in the time zone of the server, session, user. Now one of the helper functions we've grown to depend on is to_char() which supports timestamp and timestamp with timezone among many other types and allows you to format the pieces of a timestamp any way you like. This function is great except for one small little problem, it doesn't allow you to designate the display of the output timezone and always defaults to the TimeZone value setting of the currently running session. This is normally just fine (since you can combine with AT TIMEZONE to get a timestamp only time that will return the right date parts, except for the case when you want your display to output the time zone -- e.g. EDT, EST, PST, PDT etc (timestamp without timezone is timezone unaware). In this article we'll demonstrate a quick hack to get around this issue. First let's take to_char for a spin. We see we can change the time zone and have to_char register a date time for that time zone. One way which I admit is not that elegant is to wrap the set call in a function and then reset when done. It's not elegant mostly because it's not clear if there would be side issues resulting from this. In a parallel process there might be, but since PostgreSQL doesn't support parallel processing at this time, there shouldn't be. UPDATE Simon Bertrang suggested using set local instead of local which is a much better solution since it only changes the local state. We've crossed out ours and replaced with his revision. PostgreSQL 9.2 beta3 got released this week and so we inch ever closer to final in another 2 months or so. One of the great new features is the built-in JSON type and companion PLV8/PLCoffee languages that allow for easy processing of JSON objects. One of the use cases we had in mind is to take as input a JSON search request that in turn returns a JSON dataset. If you are on windows and don't have plv8 available we have PostgreSQL 9.2 64-bit and 32-bit plv8/plcoffee experimental binaries and instructions. We haven't recompiled against 9.2beta3, but our existing binaries seem to work fine on our beta3 install. This is a very basic search that assumes certain arguments of search term, page and offset are passed in the request.
" WHERE prod_name ILIKE $1 LIMIT $2 OFFSET($3 - 1)*$2"
" WHERE prod_name ILIKE $1 LIMIT $2 OFFSET ($3 - 1)*$2"
This particular file is noteworthy in 2 ways - it has line breaks in one of the columns which is a quoted column, thus the need to specify quote attribute, and not all rows have the same number of columns. You can download the sample file planet_aggregators.csv if you want to play along. Querying the table is easy. The standard way works and gives you a all rows. This doesn't work because in order to use the hstore function that matches headers with values, the header and value arrays must be the same bounds. Makes sense. We are the windows package maintainers of PostGIS. We build these packages using MingW chain of tools. For other packages we fancy that do not come packaged with the windows VC++ builds, we also build these under mingw. We've described some of these already in File FDW family. For windows 32 builds we build with the commonly known MSys/Mingw32 chain (but an older version 1.0.11) because of issues we have building with the newer msys/mingw 32. For windows 64-bit installs, we build with the mingw-w64 chain and in fact we like the ming-w64 chain so much that we plan to migrate our Mingw32 to mingw64. We have PostgreSQL 9.2 and PostgreSQL 9.3 successfully installing under the mingw-w64 for windows 32 just fine (older PostgreSQL we experience a winsock.h something or other error which we are working on troubleshooting. For 64-bit we use ming-w64 for building extensions for PostgreSQL 9.0-9.2 and soon 9.3 with some minor issues. Some people have asked us, why put yourself thru this torture? Why not just build on MS VC++ for everything? Originally we had started on mingw because PostGIS needed a Unix like environment to compile and run thru the battery of tests. This is still the case, though PostGIS is planning a CMake move with help from Mateusz Lostkot which hopefuly will provide a better cross-platform experience and allows us to integrate pgRouting (which already is on CMake). Paul Ramsey rewrote many of the regression test scripts to be completely Perl based and not require sh. The other reality is we just prefer mingw and can't really stomach having to work with VC++. I'll describe why and why not build with mingw and deploy on VC++ compiled PostgreSQL. Depending on whether we build for 32 or 64 I just toggle 32/64. The login seemed to be required to get libtools to work properly. VC++ we just don't care for. That is because we are web developers and only use VS for ASP.NET development. Having to then add in the VC++ is just another hassle. Each version of PostgreSQL (at least the EDB ones that most people use), are compiled with different versions of VC++ each requiring their own VC++ runtime distributed. So for example 9.1 was built with VS 2008. 9.2 will be built with VS 2010. PostGIS has a couple of dependency libraries which we build once for each PostGIS release and share across all the PostgreSQL versions and there is only one or two extra helper dlls to package for these (the stdc++ ones) which get copied in the PostgreSQL bin. If we were to build under VS we would have two choices: 1) build using the VC++ EDB builds with, yet another clutter of our workspace or 2) package whatever runtime libraries we are using which would make our setup exe much more complicated. Many of the extensions people build for PostgreSQL, PostGIS included, assume a pgxs capable install. VC builds don't support pgxs. So if you are trying to compile an extension built by a Unix/Mac User on windows with VC++, you are screwed or have to rollup your sleeves to figure out how to hack their build script to work for you. Our VC++ skills are nil. The story is even worse for 64-bit PostgreSQL. Under mingw 32/64, it generally just works even for building 64-bit libraries. I like being special but I don't like being that special. I want to be able to compile things much the same way as anyone else working on the projects I work with. I don't want to ask other developers to make special concessions to get it to work for me and continually baby sit these changes. As it stands windows VC++ is probably the only environment that requires a non-Unix like environment to work. Sure others have idiosyncracies, but they don't require you to rearchitect your whole build system to work for them. I find it a lot easier to get a Unix developer to stab themselves with a pitch fork than to get a Windows developer to lift a finger for anything that is not a pure windows project. I'll explain in the why not section. I think part of the reason for that is that it's more common to find Unix developers that started life as windows developers. So they are familiar with both environments and the underlying codebase. The other reason is a lot of large corporations still run on windows and it makes good business sense to support people who have money assuming you can get them to shoot some of that your way. Sadly, some extensions built under MingW will not work under VC++. One example is PL/R. When PostgreSQL 8.3 came out and the packaged PostgreSQL windows installers switched to VC++ builds from MingW, it left many PL/R windows users very unhappy. For some reason the PL/R windows users were compiling under MingW wouldn't load on these new VC++ creatures. After much crying from windows folks and several of us trying to figure out what was wrong, we all concluded it was the VC++ switch. Joe Conway stepped up to the plate and proverbially stabbed himself with a pitchfork to revise his build scripts to work on VC++. This meant for him setting up a windows VM VC++ Express, running into unchartered scary territory I imagine for him. Andrew Dunstan is another fine example. Andrew, BTW your changes to FDW Fixed Length still don't work for me. I'm going to verify to make sure it's not something wrong with my environment before I bug you. Mixing build systems is really not supported and some are shocked it works. If you ask some PostgreSQL key contributors, their jaws sometimes drop when you tell them what you are doing. Enough said. Memory issues even for PostGIS the 64-bit mingW compiled works fine against a mingW PostgreSQL but crashes on the input KML/GM tests when run from sh. The odd thing is it works fine when you manually run the test from PostgreSQL VC++. So it's hard to tell where this issue is coming from and if it would exist in a pure VC++ environment. I suspect it would. Overwrite your PATH variable on your scripts. Most issues we've had with compiling not working the same on one pc from another is all the path junk brought in from windows from other installs you've got going. Suddenly your code has dependencies on dlls distributed by Tortoise etc. and you're hunting around what stray cat came thru. This is especially true when building for 64-bit. Don't install non-standard dependencies in the default location. Just add them to your path variable as needed. Case in point, each version of PostGIS uses a different version of GEOS and sometimes we have to test many. We also build for many versions of PostgreSQL. Keeping these separate helps immensely. Use dependency walker to check what dlls you are missing. Most often, a mingw library doesn't load on VC++ build because you are missing libstdc++ or some other c helper library. Often times you need others (PostGIS has several like libgdal, geos, proj, libxml-xml2 etc.). Dependency Walker will help you sniff out these issues. The PHP script is shown below. To keep it short, we just put the connection string right in the php script and did away with all the try / catch logic we usually put in. For the client side JQuery side, we did away with all that css fanciness to make this short. Also not much in the way of error handlers. The searchInventory function that gets triggered on click of the search button does most of the work by packaging the form search variables into a json request, handing it off to the php script, and then processing the json dataset that comes back. A good portion of the code uses JQuery idioms and functions. If you do a lot of web-based GIS applications, a common desire is to allow a user to draw out an area on the map and then do searches against that area and return back a FeatureCollection where each feature is composed of a geometry and attributes about that feature. In the past the format was GML or KML, but the world seems to be moving to prefer JSON/GeoJSON. Normally you'd throw a mapping server that talks Web Feature Service , do more or less with a webscripting glue, or use a Webservice such as CartoDb that lets you pass along raw SQL. In this article we'll demonstrate how to build GeoJSON feature collections that can be consumed by web mapping apps. using the built in JSON functions in PostgreSQL 9.2 and some PostGIS hugging. Even if you don't use PostGIS, we hope you'll come away with some techniques for working with PostgreSQL extended types and also how to morph relational data into JSON buckets. As you can see it's not the nice flat tabular looking thing we relational database folks have grown to love. It's got a few curves here and there and the geometry column is output separate from the other fun loving attributes. This is different from what we showed in PostgreSQL 9.2 Native JSON type support. While you need PLV8JS to consume something like this, you can generate something like this with barebones PostgreSQL JSON support. So how do you do that?